One of the high-profile smartphones unveiled in Q2 that hasn't been yet released in Canada, Asus Zenfone 3 is now available for pre-order. Although Asus Canada has yet to announce an official release date for the Zenfone 3, the smartphone is finally up for pre-order in the country. Customers will have to pay $429.99 for the Zenfone 3, but it's unclear when it will ship. It's also worth mentioning the smartphone is available in two color options: dark blue and white. All in all, let's hope Asus Canada will soon have more info on when exactly the Zenfone 3 will hit shelves in the country. Until then, you might be interested to know that for $430 you'll be getting powerful enough smartphone that ships with Android 6.0.1 Marshmallow right out of the box. There's a high chance the Zenfone 3 will be getting an Android 7.0 Nougat update in the coming months. 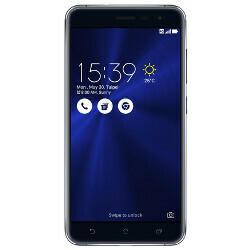 The Asus Zenfone 3 now available for pre-order in Canada comes with a 5.5-inch Super IPS+ display that supports full HD (1080p) resolution. The smartphone is packed with a decent 2.0GHz octa-core Qualcomm Snapdragon 625 processor, 4GB of RAM and 64GB of internal memory (expandable up to 128GB via microSD). On the back, there's a 16-megapixel camera with dual-LED flash that should provide users with advanced features, while in the front there's a secondary 8-megapixel camera for selfies and video calls. Asus Zenfone 3 is powered by a non-removable 3,000 mAh battery, which is rated by the manufacturer for up to 17 hours of talk time (3G). Connectivity-wise, you'll be pleased to know that Asus added an USB Type-C port, along with Bluetooth 4.2 support. Lol, this phone was introduced many months ago. Barely pushing it out? For perspective: the OnePlus 3 goes for $520 CAD, as does the ZTE Axon 7 and the Honor 8. I would personally probably shell out the extra $90 to get a phone with more juice. But this is a thing of beauty. U gotta accept that. I'd get this... hopefully comes to carriers. Took forever to be pushed out tho and I got announced when? With a little luck this phone will receive Android N around july next year.